Memorial day just passed, and that’s the unofficial kickoff to Summer for most of us. And with the changing of the seasons comes the changing of the drinking habits. 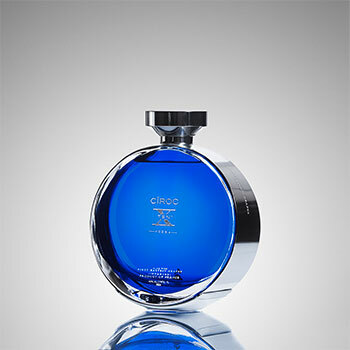 Summer brings out the rum, and flavorful vodkas, so it’s not wonder we’re seeing a lot of new product launches of late. With news of the new Ciroc Amaretto hitting shelves soon, the summer launching spree has already begun. Not to be left out, the king spirit of the summer, rum, is making waves too. Malibu Caribbean Rum has launched a slew of new flavors over the years trying to make sure they don’t get left behind with all the “innovative” vodka flavors fighting for space on the shelf and has done so both successfully and unsuccessfully. One of the firsts was Malibu Lime which didn’t last too long and was shortly after discontinued. Since then, we’ve seen Malibu Pineapple, Mango, Passion fruit, and Banana come and take off. More recently, Malibu has taken a bit more riskier approach with some not so common flavor attempts such as Malibu Red (Coconut rum with Tequila flavor), Malibu Black (Higher proof, and less sweetness), and Malibu Sunshine (Lemon and lime infused flavor). From what I’ve tried, read, and heard, the word is still out on Sunshine, Black is a hit, and Red was a dud that sounded cool in theory but just hasn’t caught on. But you can’t blame them for trying. When your competition is sputtering out flavor after flavor, you dont’ want to take the chance of becoming the old bottle on the shelf. Funny thing is, sometimes what isn’t broke doesn’t need fixing. Malibu Coconut Rum has long been a party drink of choice; smooth rum, sweet coconut flavor, and not too heavy on the alcohol so you get just enough buzz to keep the party going. 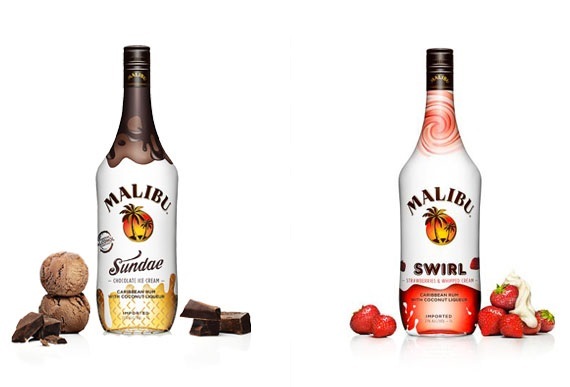 That being said, the creative team behind Malibu has just launched their latest additions to the brand family, Malibu Sundae and Malibu Swirl. Malibu Sundae and Malibu Swirl are the brands first attempt at attacking the confectionery spirits segment which has EXPLODED in the past two years with flavors like cake, cupcake, caramel, s’mores, and several others. Malibu Sundae combines the brand’s signature coconut taste with the tempting flavor of chocolate ice cream while Malibu Swirl pairs the flavor of coconut with the enticing taste of strawberries and cream. Malibu Sundae, and Malibu Swirl will be available in your typical sized, 1L, 750ml, and the picket sized and will be available at the usual 12.99-16.99 range depending on your area. I have to admit, as tired as the “flavor game” gets, I’m always interested in trying them. Probably cause I’m a lush, but that’s another post for another day. Anyway, be on the lookout for a bottle on the shelf soon and let us know what you think. We’ll be have reviewing Swirl and Sundae shortly with a few recipes for you to try at home.